In a bowl combine flour, chilli powder, cumin, paprika and five spice. Once thoroughly mixed, add in chicken strips and coat in mixture. Heat oil in a wok or large pan on medium to high heat. Add in chicken and cook until lightly brown for 3- 5 minutes. Add in chopped vegetables along with garlic, lime juice, hot sauce and Worcestershire sauce. Cook for a further 15 minutes on medium heat. As the mixture cooks,chop the tomatoes and add lettuce, and cucumber into a serving bowl. Once cooked, serve fajita mix with whole wheat wrap. 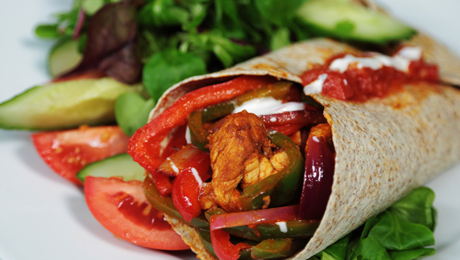 Add a spoonful of fajita mix into wrap with salsa and natural yogurt. Wrap or roll up the tortilla and serve with side salad.